Washing your own car can lead to even better results than paying for a commercial car wash. Many car washes use big brushes or abrasive materials and employ a poor washing technique that can only end up damaging your car’s paint or leaving unsightly scratches and swirl marks. You also save yourself money when you wash the car yourself. Plus, it can be a relaxing and fulfilling weekend activity. As with any DIY tasks, achieving the best results for your DIY car wash entails proper techniques and the right tools for the task. Check out the list below for the essential car wash tools to keep your beloved ride sparkling new. When you are cleaning your car, one of the first things that you are going to need is a good microfiber towel. Using a normal towel that you would use in your bathroom is not going to be optimal for washing the car. These towels can be a bit too coarse in some ways, and they may not dry the car properly. A good microfiber cloth is a safe way to dry off your car after you wash it. These microfiber towels are becoming more popular all the time. Many people keep microfiber towels around in order to clean their televisions and other important devices. You should seek out a microfiber towel that is around the same size as a traditional towel to use for the car. You should be able to find one easily at most department stores and even at hardware stores. This towel is excellent to use for car washing. It will be a safe way to dry your car without having to worry about scuffing it. These towels are even capable of being run through your washing machine, so they’re reusable. It is possible to buy towels like this in packs, but this one here is an individual towel that is available for purchase. You can also seek out a microfiber towel that is specifically meant to be used on glass. When you’re drying and cleaning off your windshield, you want a towel that is going to do the job correctly. For this reason, seeking out a microfiber glass towel is sensible. It is going to be able to make your car washing job that much easier. Towels like this are fantastic for cleaning windows without leaving streaks behind. You’ll have a crystal clear windshield, and you’ll be able to get the job done quickly. In addition, these are excellent towels to keep around simply because they can clean your windshield effectively without the use of chemicals. When you apply a little bit of water to the towel or to the windshield, you will be able to wipe things up without any problems. This is a very high-quality microfiber that is being used here. These towels won’t leave lint behind, and you’ll love how effective they are at cleaning. You can wash these in your washing machine, much like the towels mentioned above. It’s convenient to keep some of these towels in your car at all times, in case you need to clean the windshield off. When you need to wash dirt and grime off of your vehicle, you need the perfect tool for the job. You know that you’re going to need soap and water to get rid of the dirt, but you’ll also need an effective brush. You need to seek out a car washing brush that is going to work perfectly for your purposes. This will allow you to wash your car swiftly and effectively. This car wash brush here is simple and easy to use overall. The brush itself is made out of soft poly fibers that are capable of cleaning your car without scratching it. It will glide smoothly over the car while still doing a great job of getting deep to scrub out the grime. You’ll have a much easier time when you own a good car washing brush like this. There is a hole where a pole can be attached to this brush, too. This will help you to clean off the roof of your car without having to reach up. It can also be convenient for people who own trucks that stand taller than traditional cars. This is a must-have car washing tool that you’ll want to purchase as soon as you possibly can. You will also be able to find car washing brushes on the market that are meant to be held in your hand. The general feel of these brushes is the same as the model being shown here. It’s just that this one has the convenient option of being used with a pole. Buy whichever type of car washing brush appeals to you the most. You’re going to need to purchase a bucket to hold your water in. In order to effectively wash your car, it is important to have access to plenty of soapy water. You will be applying the soapy water to the car, and it will wash away all of the dirt and grime that it has built up. If you can purchase a good bucket to use for these purposes, then it will simply make the job a bit easier. You don’t necessarily need a special bucket to wash your car. Just make sure that you purchase a large enough bucket so that you can hold the amount of water that you need. This way, you won’t have to worry about emptying the bucket and refilling it in the middle of your car washing job. The bucket being shown here can hold five quarts, and this should be more than enough to wash a car. Some people like to keep two buckets handy when they are washing their cars. This idea can actually be very beneficial because it allows you to avoid introducing dirt to your rinsing bucket. You will be able to rinse off your car even more easily when you make use of this method. Whichever way you decide to go about it should be fine, though. A grit guard can actually be quite useful for car washing jobs. Traditionally, these types of tools or accessories are used to help painters make their jobs a bit simpler. This can also be a very effective tool for helping you to prevent getting dirt on your car. As you are washing your car, you will be removing the dirt from it, and it will stay trapped in the water underneath the grit guard. When you don’t have a grit guard and you aren’t using a second bucket, you run the risk of re-introducing dirt to the car. This is counterproductive and will only make your car washing job take longer. You can purchase a grit guard at a very affordable price in order to eliminate this problem. You’ll be able to get your car washing done faster, and this will definitely make you happy. 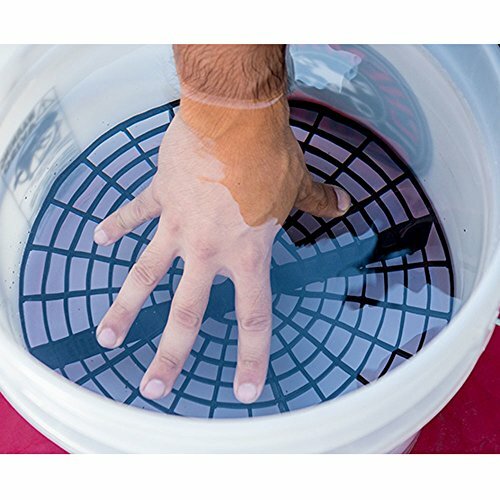 This grit guard can fit any five-gallon bucket, so you’ll be able to make use of it easily. You’ll find plenty of other grit guards on the market, too. If you want to find one that fits a specific bucket that you already own, then this shouldn’t be too difficult to do. Just look around at your local department store to see what is in stock, and you will be good to go. You’ll definitely want to have your garden hose ready to use if you are planning on washing the car. A garden hose is really good at rinsing off the car because it can shoot water at a decent pressure that isn’t strong enough to cause any harm. You’ll be able to rinse off a car quickly and wash your car really well, so long as you have a good hose. This is a staple tool for washing your car at home, and you almost surely already own one of these. If you don’t have a good garden hose, then you will definitely want to look into purchasing one. There are many different types of garden hoses on the market. Just make sure that you purchase a hose that is long enough to reach your driveway and will be able to comfortably rinse your car from all the proper angles. It shouldn’t be difficult at all to find the perfect hose to suit these needs. This garden hose has ten different spray patterns and is 100-feet long. This should be great to use for washing your car. It is made out of an incredibly rugged latex material that will stand the test of time, too. You’ll be able to make use of this convenient garden hose for many years, and you’ll always have the right tool to rinse off your car when you’re washing it. You won’t have to deal with problems such as kinks when using this hose, either. In addition, it folds up neatly to allow you to store it effectively when it isn’t in use. There are a lot of positives about this hose that makes it a recommended purchase. Buy yourself one today if you are in need of a garden hose for any reason at all. Owning a pressure washer is another thing that could come in handy when you are washing your car. A pressure washer, when used properly, can be a very effective tool for car washing. You do have to be careful though because some pressure washers are powerful enough to severely damage a car. You’ll need to use a pressure washer at the proper settings in order to avoid causing damage to the car’s paint or windows. That being said, a pressure washer can help you to remove deep grime from a car with relative ease. You will simply want to be very familiar with the pressure washer before you use it on something sensitive like your car. You want to avoid making any costly mistakes. Many people prefer to use the garden hose for safety reasons, but your pressure washer will truly do a good job, so long as you’re careful. It is also easy to apply attachments to pressure washers. You will be able to attach things to make car washing easier. This will allow you to apply soap to the car and really give it a deep cleaning. It’s something you should consider purchasing if you want your car to be as clean as possible. This pressure washer being shown here is an electric model. You will also find gas-powered pressure washers on the market. The gas-powered models are more powerful overall, but an electric model is probably going to be best for these purposes. This model is powerful without being dangerous, so you’ll be able to use it effectively to wash off your car. This foam cannon attachment for your pressure washer will really come in handy when you’re washing your car. It is going to allow you to really wash your car effectively. You’ll be able to easily apply soapy water to your car using this attachment. It’s going to make removing the dirt from your car even faster than it otherwise would be. When you have a foam cannon attachment for your pressure washer, it will be possible to avoid doing as much scrubbing as usual. You won’t have to spend as much time meticulously cleaning the car with your car washing brush. This is convenient for when you want to clean the car properly, but you don’t have quite as much time as you would like. It will be a good experience overall and will definitely allow you to get the most use out of your pressure washer. 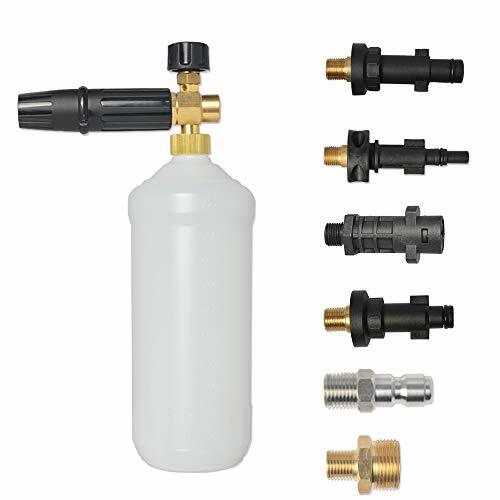 The nozzle will connect to your pressure washer very easily. Just make sure that the model of pressure washer that you own is capable of producing 1450 PSI so that this can be used properly. This should also be quite useful when you want to wash your windows and the siding on your home. It’s a worthy purchase that you’ll be using a lot around your house. Another part of cleaning your car is washing off the rims. You want your rims to look vibrant and shiny so that your car has a good profile on the road. In order to make your rims look great, you’re going to need to clean them off with the proper brush. Buying a high-quality wool wheel brush is going to make this task as simple as it can be. This brush has a fairly long handle that makes reaching certain spots of your rims and wheels easier. You’ll be able to get down and clean your rims very effectively with this tool. The fibers on these wool wheel brushes are very plush, and they won’t cause any harm to your wheels. You’ll be able to avoid making scratches on your wheel wells or the rims. This set comes with three different wool wheel brushes that will be good for different purposes. Each of these brushes is a different size, and some of them will be fantastic for getting into small crevices. This will allow you to easily get rid of grime and dust that has built up over by hard to reach spots. You’ll love being able to make cleaning your wheels an easy job with these brushes. A set of car wash mitts is going to be a useful thing to own when you want to wash your car effectively. This can actually take the place of your car washing brush, in some situations. You will be able to wear these mitts and simply rub your hands across the surface of your car. This makes cleaning the car feel even easier than it usually does. Some people prefer using these mitts to using a car washing brush. In some ways, it can be a very effective tool. It is easy to apply the amount of pressure that you need to while you’re wearing the mitts. It should be great for applying certain waxes to your car, as well. You’ll definitely find a use for these mitts if you decide to purchase them. These mitts here are made out of a microfiber material. They will work great for wiping away grime and finishing up your car washing job. The gloves come in multiple sizes, so you should be able to find a pair that fits you perfectly. You will be able to purchase mitts that are made out of sheepskin if you prefer that material, but these microfiber mitts are more absorbent overall. Some people like to use compressed air to dry off certain parts of their cars. If you have an electric blower of some kind around, then you can also use that to do the same thing. This will allow you to avoid buying a somewhat costly air compressor, so using an electric blower is a good alternative. Even so, compressed air can be nice for drying off your rearview mirrors. This air compressor should come in handy for multiple purposes. You’ll be able to make use of it around the house for various projects. When it comes to washing your car, you’ll be able to get rid of any nagging wet spots in your mirrors using the air. This can help you to avoid pockets of water that you couldn’t reach properly with your microfiber towel. Drying your car off completely is a good idea. You want to be able to avoid things such as streaks. You’ll be able to know that your car is completely ready for the road once you have dried off the car in this fashion. This isn’t an absolutely necessary car washing tool, but it can definitely be a useful one if you already have an air compressor. Owning a bug scrubber sponge will be really nice for cleaning off bugs from your windshield. It will work well for cleaning bugs off of any part of your car. The sponge itself is made out of a material that makes cleaning your car simple. This is a polyester microfiber blend sponge that will work well without any chemicals. 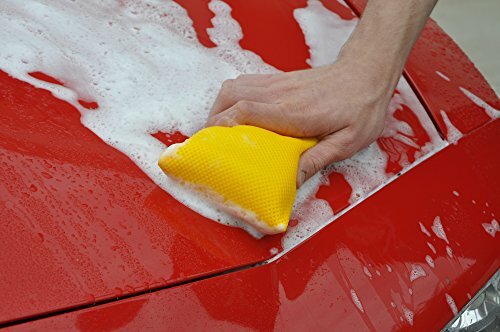 Simply using a bit of soap and water with this sponge will allow you to effectively wash your car. You can use this in conjunction with your car washing brush, or you can choose to just use the bug scrubber sponge. It is really up to you on how you want to approach things. This will work very well to remove dirt, grime, and caked on bugs that have built up over time. This sponge is incredibly absorbent as well. It can actually absorb even more water than a traditional sponge, making it easy to clean off your car without having to stop too often. This is a good alternative to a traditional car washing brush. It will be a handy tool to own that will make car washing that much more enjoyable. A clay bar is a pretty famous car detailing tool that is used by many professionals. People who just wash their cars at home also like to make use of these convenient tools. Using a clay bar on your paint while you are washing it can help you to smooth out the surface. If your paint is feeling rough in any way, due to grime and other factors, then using a clay bar can remedy the situation. You don’t necessarily need to use a clay bar every time that you wash your car. It is recommended that you only use the clay bar when you feel like the surface of the car is a bit rough. You should always use your best judgment in order to get the best results. Using the clay bar along with some soap and water will allow you to smooth out the surface of your car effectively. Your car is going to look awesome after you use the clay bar properly. It is a tool that the professionals use to help give your car that fresh and shiny look. You’ll be able to purchase your own clay bar at a fairly reasonable price. This pack comes with two clay bars, so you should be able to make use of them for quite a long time.